ALICE'S ADVENTURES IN WONDERLAND [&] THROUGH THE LOOKING-GLASS. Reader's Digest Best Loved Books for Young Readers: Alice's Adventures in. 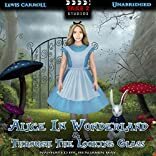 Alice's Adventures (Alice) in Wonderland and (Alice) Through the Looking Glass. Alice's Adventures in Wonderland and Through the Looking Glass and What Alice Found There. Alice's Adventures in Wonderland & Through the Looking-Glass, and What Alice Found There. 9/22/2011 Gail Fattori said: My all time favorite book.